Almost 75 years of cartoons, on the economy. A treat. The cartoons also provide a sort of journey through time, through the times we have lived through. While some of the cartoons are topical, and have references that may not mean much to most people today, others are timeless. These cartoons talk about highly paid executives, salaries, bonuses, and more. 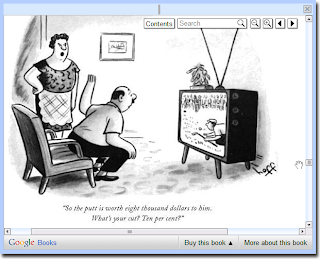 You can pick the book and select pages from any decade, and the cartoon will elicit a chuckle. Now surely that's got to be worth something in these trying economic times. The cartoons are by and large funny. Sometimes poignant, sometimes very timelessly relevant. And sometimes it is difficult to get the context that inspired the cartoons. There is a short index at the end of the book, with a listing of each cartoonist whose work has been featured in the book. You can see some cartoonists occur much more than others. 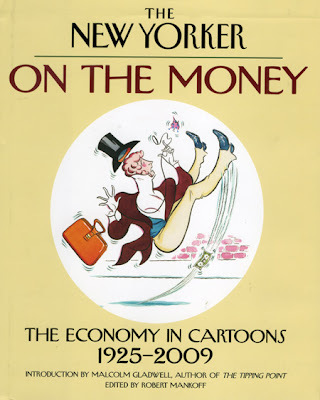 The most prolific cartoonists are Robert Mankoff, who incidentally, is also the editor of this compilation, Robert Weber, Lee Lorenz, William Hamilton, Alan Dunn, Dana Fradon. Some like John Agee, Marissa Acocella, Ed Frascino, Rea Irvin, Robert Kraus, and others feature only once. 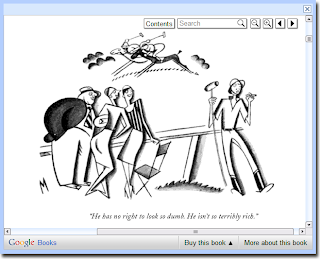 - a couple of women looking at a polo player and remarking, "He has no right to look so dumb. He isn't so terribly rich." - a happy mother handing a bill to the father, "Darling, here's the bill from the hospital. One more installment and the baby's ours." - a pilot telling his co-pilot while pointing at the controls in the cockpit, "Most of them are mysteries to me, but that one on the right gives stock-market averages." - two young ladies having a smoke in a club, "He's an investor, or speculator, or embezzler - anyway, he's rich." - a woman admonishing a bill collector at the door, "Has it occurred to you that if everybody paid their bills on time, you'd be out of a job?" - a ticket collector in a train remarking to another, "Here's a 'Wall Street Journal' that appears to be streaked with tears." - a huckster trying to lure a pedestrian - "Psst! Next Friday's 'Wall Street Journal'?" - a buxom blonde telling a nonagenarian at a dinner table, "Gee whiz, Mr Curtis, a million dollars isn't old!" - a secretary's reply to a visitor, "I'm afraid Mr Koerner is no longer with us. He was taxed out of existence." - a 'silent' cartoon depicting humpty dumpty sitting on a street sign that says 'Wall Street', looking down at a bemused pedestrian. - a couple watching a news story on television, "Today the secret ingredient for Mom's Apple Pie were sold to the Japanese for sixty-eight million dollars." - Wall Street executives remarking at a party, "As far as I'm concerned, they can do what they want with the minimum wage, just as long as they keep their hands off the maximum wage." - a banker revealing to a couple, "Your money was working for you, but it suddenly quit and now it's working for me!" - One executive remarking to the other; "These new regulations will fundamentally alter the way we get around them." One has to wonder after reading the introduction and the cartoons themselves just what exactly did Malcolm Gladwell bring to this book. The cartoons themselves are mostly funny and often brilliant to stand on their own in this collection. Gladwell's commentary is fairly un-illuminating. 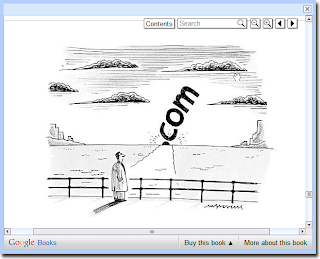 Perhaps the publisher weren't confident the book could sell on its own merits?